This product contains high levels of pure cold pressed Evening Primrose Oil that is extremely affective on animals with skin disorders. The development of this shampoo has taken us over seven years and the achievement of suspending such high levels of natural oil within a shampoo is unique. 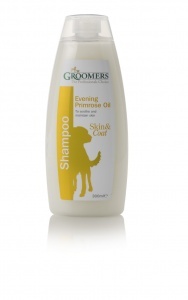 This dog shampoo has been found to improve skin disorders such as eczema dust mite and disorders of unknown origin.